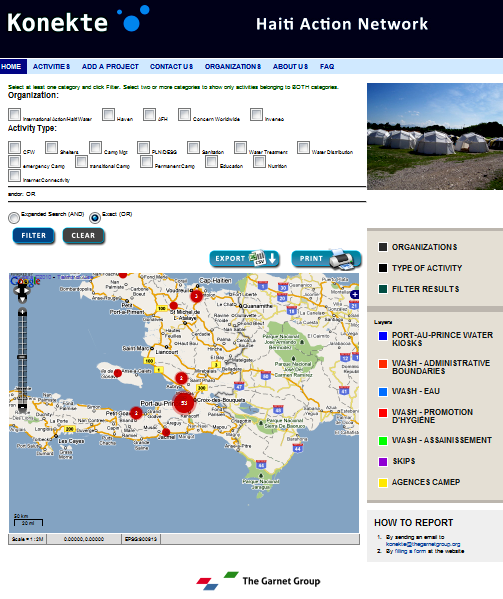 Konekte (Haitian Creole for "Connect") is a web-based application that allows multiple organizations to geographically map projects, events, and/or activities using either GPS coordinates or street-level map locators. Resulting map views are scalable from country-level down to street level using built-in Google Map overlays. 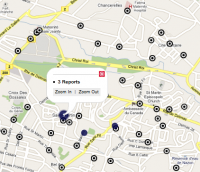 Visual map representations of these points on a map are supported by linked, printable tabular data of any type. 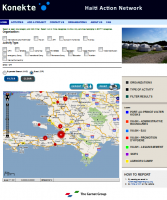 Users can see co-locations, proximities, and geographic densities of projects, events, and/or activities. User-selected sorting filters allow visualization by single or multiple organizations and/or specified project categories. 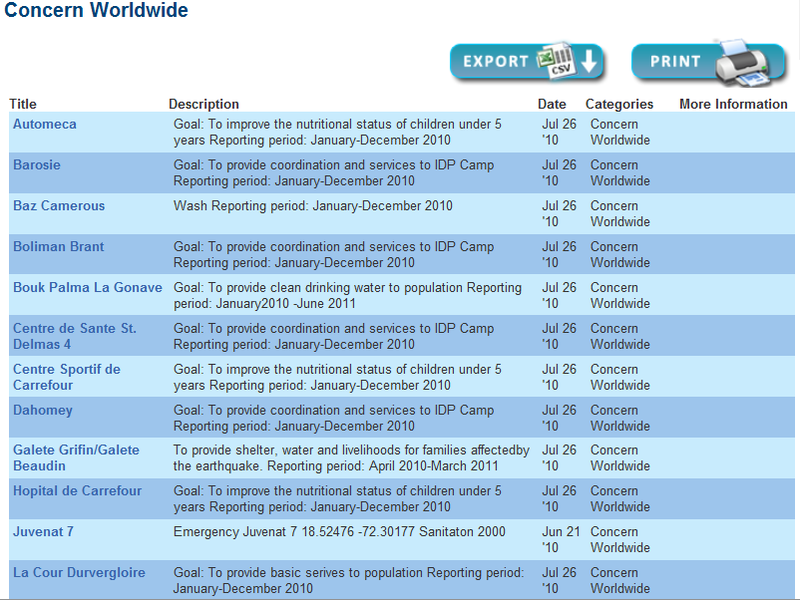 Konekte allows multiple organizations to load their own data remotely online or by using a web-based form, view data from other users, perform selective sorts of their and others' data, print and/or export resulting maps and tables of corresponding data in CSV or Excel formats, and attach photos or videos to specific projects/activities. At present, Konekte is specifically tailored for use by members of the Clinton Global Initiative's Haiti Action Network, but is easily configured for other multi-orgaization or multi-location client. Konekte can focus on any geographic location in the world to provide valuable visual and tabular information on a web-based system. See the geographic proximity of their activity sites to those of other members to potentially coordinate joint services, joint materiel procurement, joint transportation and storage of supplies, etc. Map transportation routes to, from, and between activity sites. Attach photos to each site showing their work at that site; also attach links to videos which can be viewed though YouTube. 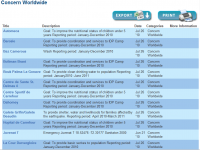 Display information on the member's organizational mission, projects, etc. Links in Konekte will connect to the member's website for more information. Optionally, arrangements can be made to link to Konekte from the member's website so that potential donors can locate each of their activity sites anywhere in the world.